The textile industry leaves one of the largest water footprints on the planet. During the dyeing process, an average t-shirt will use 16-20 liters of water, which means that on average, the global textile industry discharges 40 to 50,000 tons of dye into our water system. That’s a lot. So it’s no surprise that textile dyeing has become a huge burden on our environment AND the garment workers who work closely with the dyes themselves. But before we get started and talk about what we can do as conscious consumers to promote safer dye treatment, let’s talk a bit more about textile dyes and the difference between synthetic and natural dyestuffs. The earliest evidence of textile dyeing dates all the way back to 34,000 BC, when archaeologists first discovered dyed flax fibers in a prehistoric cave from the Republic of Georgia. Until the mid-1800s, natural dyestuffs were commonly used throughout human history, derived from products such as flowers, roots, vegetables, insects, minerals, wood and mollusks. In 1856, William Henry Perkin invented the first synthetic dye from coal tar, and by 1900, nearly 90% of industrial dyes were synthetic. After all, why work with natural dyes when batches of natural dyed textiles were never alike, and synthetic dyestuffs could be manufactured consistently and on a much larger scale? In the eyes of the public, natural dyes are generally perceived as harmless and safe for the environment. However, let us quickly rectify this as not ALL natural dyes are benign. For instance, some natural dye sources (such as bloodroot and logwood) can be toxic to wearers. And while most natural dyes are safe and harmless, they can be rendered toxic when the mordant is applied (FYI, mordants are substances used to make the natural dyes stick to fabrics such as copper, iron, and aluminum). This isn't to say that natural dyes can't be better for our environment than synthetic dyes, but we think it's important for consumers to know that natural doesn't always equal healthier. Now, let's talk about synthetic dyes, which, as we stated above, make up nearly 90% of industrial dyes. These dyes are either classified by their chemical composition, types of fibers to which they can be applied to, by method of application, or by hue. Each fiber reacts differently to dyes, so thus we have various dye categories (to name a few: acid dyes, basic dyes, azoic dyes… the list goes on). Now, we won't go into the nitty gritty of each dyeing process, but what's important to know is that during the coloration process, a large percentage of the dye (no matter which method) does not bind to the fabric and is lost in the wastewater stream. 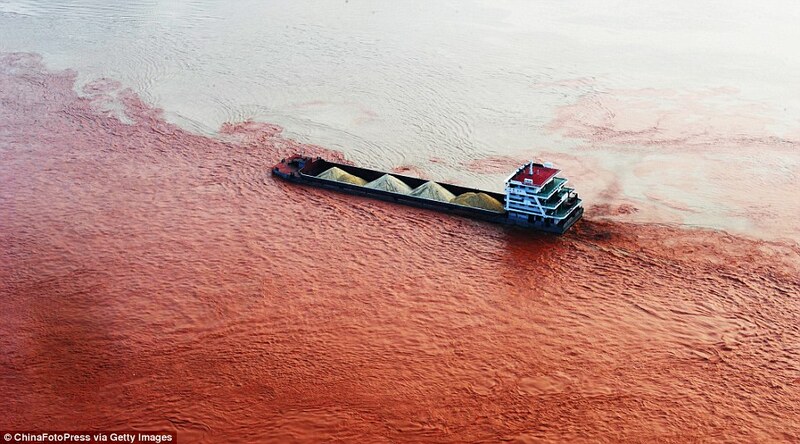 Roughly 17% to 20% of industrial water pollution is owed to fabric dyes and treatments, and approximately 10 to 15% of dyes are released into the environment during the dyeing process, resulting in the discharge of many chemicals, the death of aquatic life, the ruining of soils and poisoning of local drinking water. While most, if not all first world countries have laws in place to prevent this sort of environmental contamination, it's a very different story for developing countries where many fast fashion retailers have moved their production to. In fact, dye houses in India, China and Indonesia are notorious for not only exhausting local water supplies, but for dumping untreated wastewater into local streams and river. In China, estimates say 90% of the local groundwater is polluted, and according to the World Bank, 72 toxic chemicals in the water supply are from textile dyeing. For every pound of textiles produced in Indonesia, a pound of chemicals is broken down and later illegally bled into the Citarum River. Now, it’s pretty obvious that the discharge of millions of gallons of hazardous toxic waste into our water system isn’t a good thing. Dye discharge typically includes sulphur, napthol, vat dyes, nitrates, acetic acid, soaps, and heavy metals, making it highly toxic. Other harmful chemicals include formaldehyde-based dye fixing agents, hydro carbon based softeners and non-biodegradable dyeing chemicals. This waste discharge is also often of a high temperature and pH, which are both extremely damaging to the environment. Aside from all the toxic chemicals released, another great environmental concern is the absorption and reflection of sunlight entering the water. Textile dye discharge makes our water oily and coloured, increasing the turbidity and giving the water a bad appearance and foul smell. This ultimately prevents the penetration of sunlight necessary for the process of photosynthesis, consequently diminishing the photosynthetic activity of algae and affecting the entire food chain. This depletion of dissolved oxygen in water also hinders with the self-purification process of water, and clogs the pores of soil when allowed to flow into fields, resulting in loss of soil productivity. When in contact with sewage pipes, this waste water corrodes and incrustates pipes. And if allowed to flow into rivers, it effects the quality of drinking water in hand pumps making it unfit for human consumption. At the end of the day, it’s worthy to note that textile effluent is the cause of significant amount of environmental degradation and human illnesses. About 40% of globally-used colorants contain organically bound chlorine, a known carcinogen. All the organic materials present in the wastewater from a textile industry can react with this chlorine, and chemicals evaporate into the air we breathe or are absorbed through our skin and show up as allergic reactions, respiratory diseases, skin irritations, and can even result in an increase in tumours. Unsurprisingly, these diseases are most prevalent in garment workers who handle the dyes. So here’s what we know up until this point: natural dyestuffs aren’t always good and synthetic dyestuffs are terrible for both the environment, garment workers, and wearers. So where does that leave us? Well, let us introduce you to GOTS, otherwise known as the Global Organic Textile Standard. GOTS is the “worldwide leading textile processing standard for organic fibres, including ecological and social criteria, backed up by independent certification of the entire textile supply chain” (GOTS). The aim of GOTS is to define world-recognized requirements that ensure the organic status of textiles, from harvesting of the raw materials, through environmentally and social responsible manufacturing up to labelling to provide a credible assurance to the end consumer. It also evaluates all dyes to ensure that they meet basic requirements on toxicity and biodegradability/eliminability. Another similar organization you’ll want to keep your eye on is Oeko-Tex, which stands for the International Association for Research and Testing in the Field of Textile and Leather Ecology (phew). Like GOTS, the Oeko-Tex certifies textiles based on how they are processed, including dyes and finishes, to ensure that the textiles are certified free of harmful chemicals and are safe for human use. For more reading, check out our sources here: Scientific Research, The Guardian, World Bank, Textile Learner, GOTS, Oeko-Tex.